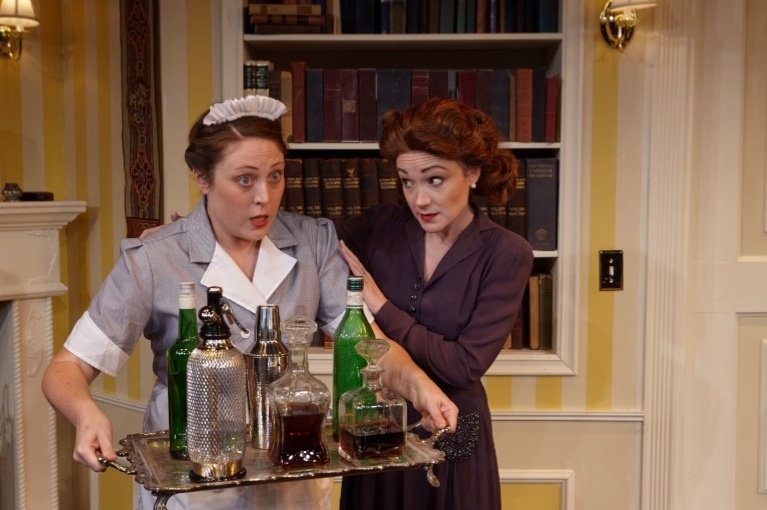 Carol's Theatre Reviews ~ It's Fun To Go Out: North Coast Rep. 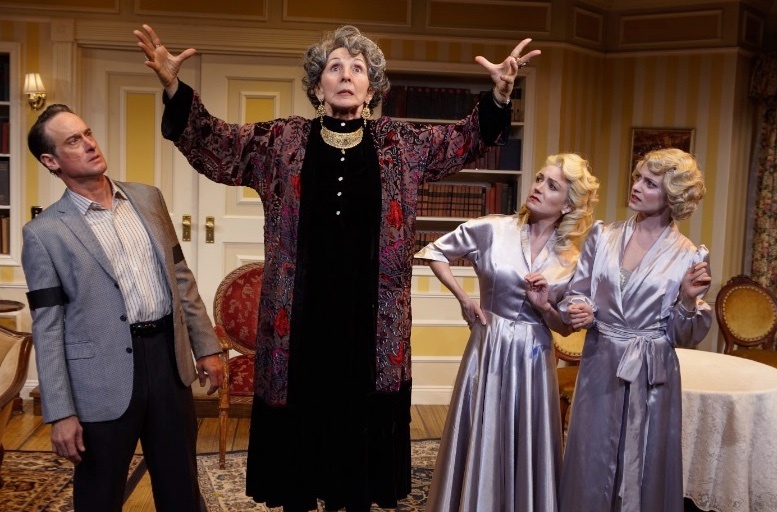 Channels Noël Coward’s “Blithe Spirit” In A Charming Production. North Coast Rep. 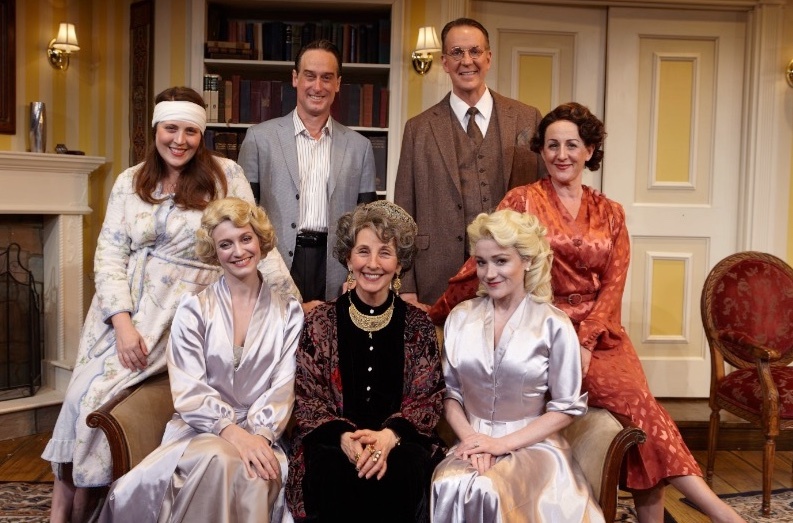 Channels Noël Coward’s “Blithe Spirit” In A Charming Production. 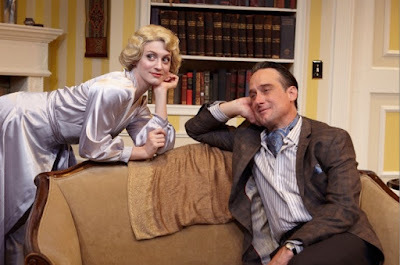 This is probably as good a time as any to mount a Noël Coward Play. 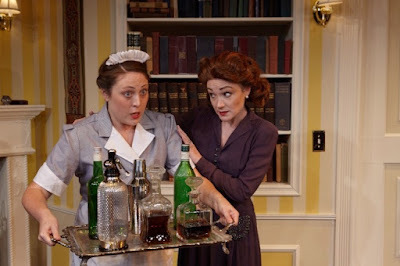 With so much animosity and nastiness in the media these days, that we can’t seem to escape, Coward’s classic “Blithe Spirit”, now being presented (to open North Coast Repertory Theatre’s thirty seventh season) in Solana Beach through Oct. 7th might bring some levity on to the scene if only for the two or so hours the cast is able to hold our interest and charm us. It’s classic, witty, sophisticated Coward, and under Reynolds direction, all I’s are dotted and T’s crossed and accents in their right places. Coward’s 1941 farce “Blithe Spirit”, while then the object of some pushback because of the war, managed to win enough audience approval that it went on to set British box office records of 1,997 consecutive performances for a non musical play in the West End. We don’t see enough Noël Coward these days for various reasons and the big one is that some of his plays seem dated but this one does pass muster. It is upper crust at its best and if you can’t get enough of how ‘the other half lives’ entertainment, this just might be your cup of (high) tea. Charles Condomine (J. Todd Adams) and his second wife Ruth (Joanne Strapp) are awaiting the arrival of their friends Dr. George and Violet Bradman, (Gil Berry and Ava Burton) for an evening of séance at their home. In the mean time they are trying to rein in their maid, Edith, (Michelle Marie Trester) from running a marathon every time she enters the room. Slow and easy as she goes is their advice. She’s new at the job! 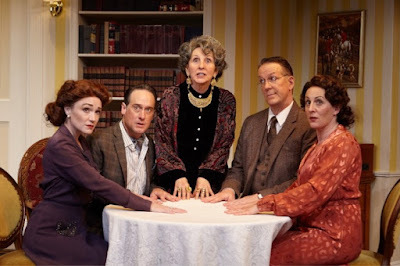 The local (eccentric) medium Madame Arcati (Susan Denaker) is asked to lead the séance and she is, as we will later learn, surprised by her own powers. She arrives on bicycle all agog. Unbeknownst to her Charles is collecting information about a new thriller he is writing and wants to learn more about the world beyond and the occult. After dinner and before they get started, she fires up the gramophone and begins to play her favorite song “Always” since she uses it as her spiritual guide. After a slow start and some table rattling, Madame Arcati inadvertently summons Charles’ late first wife Elvira (an ethereal looking Teagan Rose). She has been dead for seven years (“she must have been on a waiting list”) and is itching to come back and haunt Charles and his now wife Ruth. At first, Charles is not at all amused. Much to Ruth’s chagrin, when Elvira does appear on the scene, and she is only visible to her husband Charles, both become unglued. The havoc begins when Elvira and Charles chat with each other but this doesn’t happen until Madame Arcati recovers from a fainting spell. (She seems prone to them) Arcati flees the house through the side French doors, in a tumultuous tide of confusion. Elvira begins playing with Charles’ head and while the two seem to be having too much fun at Ruth’s expense, Ruth wants Elvira dead, back to the grave gone! To the contrary, Elvira wants Charles dead so she and he can be together again. As mentioned earlier Teagan Rose’s Elvira dressed in Elisa Benzoni’s costume design of white flowing gown and looking OH, so very lovely and very charming and very pleased with herself as the ghostly wife, but who still knows how to push her late husband’s buttons, is a force with which to be reckoned. She criticizes his wife’s taste in their house furnishings and upsets their uneasy balance and calm they’ve created as she is especially aware of the fact that her ex husband is still attracted to her, or so it seems. She turns in a wonderful and ghostly performance, showing up here, disappearing there, teasing and egging him on but never disappointing. Adams is perfectly suited as the suave, easy as he goes egotistical and narcissistic husband who seems to love the idea that his two loves (not including the ones he took while married to both women) are fighting over him. Both on opposite ends of the spectrum, Ruth is domineering and shrill while Rose is soft, teasing and inviting, yet still having sway over him from the grave. Joanna Strapp’s Ruth, while trying her best to be the perfect society wife, seems to be the also ran. One might feel a twinge of sympathy for her if she weren’t so shrill and overbearing. Both Strapp and Rose look absolutely right out of the Noël Coward playbook, society perfect in public, cutthroat in private. Susan Denaker is wonderfully eccentric as Madame Arcati, the oft times bewildered medium. She is a fine choice as one who bewitches, bothers and bewilders (No this is not “Bell Book and Candle” or “Pal Joey”). Her outlandish costumes are a feast for the eyes. Michelle Marie Trester (“Romeo, Romeo, and Juliet”) works the role of Edith, the ‘doesn’t have a clue’ maid, who has a secret even she doesn’t know about. Gil Berry and Ava Burton as the Doctor and his wife are the weakest links (neither looked comfortable in their respective roles on opening night) in an otherwise perfectly cast production. Matt Novotny’s lighting design does Marty Burnett’s always functional and proper set justice. Aaron Rumley’s sound design, table rattling and with the old favorite “Always” and “Lovely To Look At” playing on the gramophone definitely defines the period. 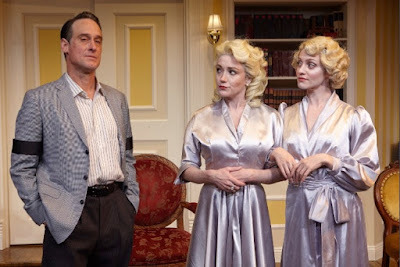 For the look, appeal and a taste of classic Coward, this fun time respit is much welcomed.